*Disclosure- I received the mentioned product courtesy of the sponsor for the purpose of this review. All opinions are genuine, based on my experience with the product, and have not been influenced by promotional items. Cool breezes, shorter days, chilly nights. Autumn is definitely on the horizon. Instead of loading up on fresh berries and other tasty fruits from the farmer's market, it's time to switch over to fall veggies. I really love making comfort foods when autumn rolls around. Squash, broccoli, potatoes... I don't think there are many fall foods that I don't like. They are so good in soups and stews, and also to eat as a stand alone side dish. 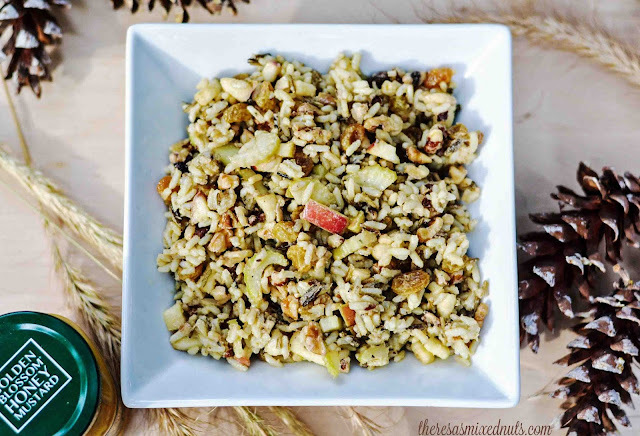 Speaking of side dishes, I was perusing Golden Blossom Honey for some new fall favorite recipes and came across this Autumn Wild Rice Salad. After scrolling through the ingredient list, I knew it was going to quickly become a fall favorite. 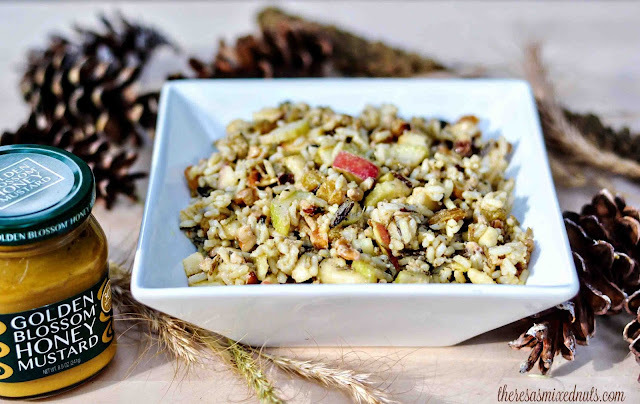 There's such an explosion of fall favorite flavors wrapped up into this simple dish, you won't be sorry if you add it to your meal plan soon. Here's my tip for getting the most out of this dish. Make the salad several hours in advance and let the flavors marry together. Leaving it in the fridge overnight really yields the best flavor results. You can find this recipe, as well as many more delicious recipes right on the Golden Blossom Honey recipe page! Be sure to follow Golden Blossom Honey on Facebook and Twitter to stay up to date on new products and promotions. If you like this recipe, be sure to come back every Friday, where I feature a new recipe from Golden Blossom Honey! What are some of your favorite fall fruits and veggies? I don't do fruits in my savoury salads :) but I do love that bowl! I love wild rice, but never cook with it much. I would be able to eat that salad. I do love rice. I like soups too. My favorites are cheesy potato, split pea, tomato based ones. I love pumpkin soup as well, but my family doesn't get into that one as much as I do. Wild rice always screams "Fall" to me! This salad sounds yummy and perfect for the season. This wild rice salad looks amazing. I am always looking for new fall recipes. I love to make squash in the fall. That sounds so good! Apple is such a classic fall flavor, and it's equally tasty in sweet or savory dishes. Love it! That salad looks delicious! This sounds like a great fall recipe. I love rice sooooo much! I also love honey (like all over fried chicken haha). This looks like a nice way to spruce up rice! Yum! That looks so good! I love wild rice. I will definitely be trying this recipe over the weekend. I am so glad fall is here. This wild rice fall salad looks amazing. Might have to add it to my fall lineup. A little savory, a little sweet, and a little crunch equals a whole lot of perfect. I would love to try this dish! This sounds like a perfect fall flavor combo! Love that sweet and savory taste! It just screams fall! You make some of the best dishes. Looks yummy. That does have a nice medley of flavors in it. I'm a huge fan of wild rice! This is a beautiful salad. The colors match the fall feeling so well! I honestly didn't drool over the salad but stared at it. It's so pretty! I couldn't eat it, I don't think! How yummy! It is a beautiful dish! I think adults and kids alike would want to dive into this meal! Going to put it on my list of things to try for sure! Thank you! I like trying new unique recipes like this one. The combination of ingredients should make for a delicious meal. My favorite veggies and fruits are broccoli, cauliflower and bananas. I don't think I've tasted this dish before or had anything similar. It looks really good and it's perfect for the season! I love to cook with Honey. This dish looks so delicious and easy to make. I will have to get the ingredients I need to make some this week. This dish look so new to me but I want to try it. I can't imagine how tasty it would be! This sounds yummy. I am loving all of the fall influence recipes lately! Such a great time of year! This sounds pretty tasty. I'm going to have to give it a try. yum sounds so great. I'd love to try this! Great! I'd love to have myself a good non-native rice variation every now and then. I'm looking forward to more recipes with Golden Honey. Golden blosom honey is becoming more and more popular to many of the people in the country.There are many ways for the improvement of this environment where the people can learn more details.The wordzopolis.com is helping the people who want to learn more recipe with the rice and how to be prepared rice salad at home within a shorter time period.